Stephen Amell of The CW’s Arrow is no stranger to the WWE. After trading social media jabs with wrestler Stardust and a physical altercation with him, Amell actually stepped into the ring during last year’s WWE SummerSlam to take Stardust on in a tag team match. Amell bested Stardust in that match, and now there’s another wrestler looking to take him on in the ring. Stephen Farrelly, also known as WWE Superstar Sheamus, recently worked with Amell on Teenage Mutant Ninja Turtles: Out of the Shadows and marveled at how well-versed Amell was in the wrestling world. He did a stellar performance at SummerSlam. I'd love the opportunity to take him on in the ring! The first time I sat down and met Stephen on set, he surprised me being a huge WWE fan, and so knowledgeable about it for all his life. I talked a bit about what I do, I was like, 'Oh you know, come off the top rope, this and that,' then he shows me this video of him doing Parkour, jumping off walls, doing flips, coming down, another flip, jump out to another wall... I was like, oh, I'll stop talking about myself now. I was pretty impressed. According to ComicBook.com Stephen Farrelly, who plays the mutant bad guy Rocksteady in Teenage Mutant Ninja Turtles: Out of the Shadows, spoke to reporters during a press conference for the film and relayed how impressed he was with Stephen Amell’s appearance at SummerSlam. And, what’s the result of Farrelly being awed by Amell’s work in the ring? He wants to fight him, you know, as one would when one notices that someone else is good at fighting. This is the kind of thing that only people who fight for a living would feel, isn’t it? Stephen Farrelly also noted that he had no idea what a huge WWE fan Stephen Amell was, but it makes a lot of sense that he would enjoy talking to someone who’s as into the sport as he obviously is. And, I guess the desire to fight another fighter/wrestling enthusiast is really like a sign of respect for that person’s talent. After all, if you’re gifted at pinning your opponent to the mat it would be beneath you to fight someone whose skills aren’t up to your level. And Amell has certainly proven his ability in the ring; he even won a Slammy Award for Best Celebrity Appearance at SummerSlam. Well, since Stephen Amell has already proven his willingness to step up and fight a WWE Superstar, there’s a chance that he’ll take his Teenage Mutant Ninja Turtles: Out of the Shadows costar Stephen Farrelly up on his enthusiastic offer. 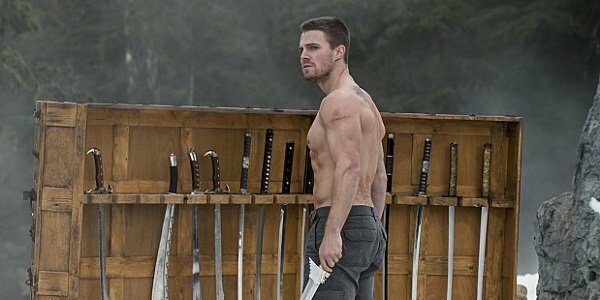 In the meantime, you can watch Amell when Arrow returns this fall on The CW.